The bald eagle, a sea eagle, (Haliaeetus leucocephalus, from Greek hali "sea", aiētos "eagle", leuco "white", cephalos "head") is a bird of prey found in North America. Its range includes most of Canada and Alaska, all of the contiguous United States, and northern Mexico. It is found near large bodies of open water with an abundant food supply and old-growth trees for nesting. Bald eagles are not actually bald; the name derives from an older meaning of "white headed". The adult is mainly brown with a white head and tail. The sexes are identical in plumage, but females are about 25 percent larger than males. The beak is large and hooked. The plumage of the immature is brown. The average lifespan of bald eagles in the wild is around 20 years. Bald eagles on the lookout for salmon. 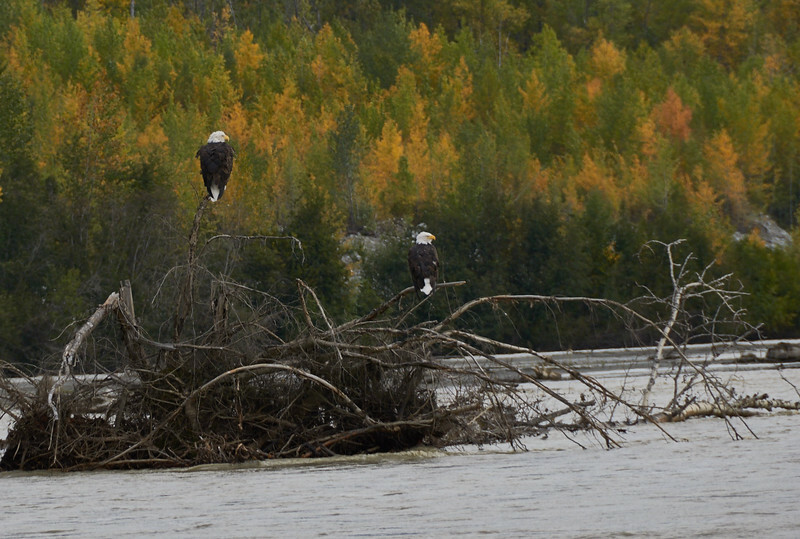 The muddy glacier melt-water accounts for the bald eagles' fishing practice in this part of the world. In clear water they can see the salmon from on high, swoop down and catch them with their claws. In this muddy water, they select low perches to target the dorsal fins of the salmon emerging from the shallow muddy waters.